Showing results for tags 'macross 2'. yellowlightman posted a topic in The Workshop! I'm a big fan of Macross II despite all of its (numerous) faults and I'm a big fan of old garage kits despite their (numerous) faults, but the old B-Club 1/100 Macross II kits really aren't great. They're from that era riiiiight before you started to see polycaps in a lot of mecha kits and the result was some pretty awkward posing that didn't quite reflect the dynamic poses you see in the anime itself. I mean, come on: Anyways, I've got one of the B-Club Metal Siren kits and recently started thinking it might be a worthwhile project if I tried to add some polycaps to give it a bit more movement. Granted, I'm not hoping for a full range of movement or anything resembling modern standards of poseability, but ideally I'd like to find a little flexibility so that it doesn't look quite so rigid (and adding polycaps might help "stretch" out the arms and legs a bit and keep it from looking so stumpy, check out the legs in the VF-2J kit above -- they all look like that). Oh, and I've never done anything quite like this before so who knows how it'll go. I began with the shoulders because that seemed to be the easiest place to start. Thankfully the design of this kit is such that for most joints, it's designed with a deep concave area on one part and a long protruding piece that fits into it. In theory that gives the builder a bit of flexibility with how they drill and pin the pieces together, but it's not quite what I want to do. The upside is that with a bit of cutting it should give me enough ample space to put in some polycaps. This won't be true for all joints on the kit, but definitely is for the shoulder and elbow joints. I'm using a bit of wall adhesive to keep the polycaps in place, which is also why the elbow joint doesn't fit quite as snugly into the forearm as it will when I'm finally ready to glue everything together. Unfortunately, ball joint pieces aren't going to give great flexibility for shoulder and elbow movement, but any other type of polycap joint would require some serious cutting. It'll do. Here you can see what the joints look like at the kit originally was designed. The polycaps definitely don't sit quite as flush, but I think once there's some paint on everything they'll be harder to spot. Yeah, it's coming: http://www.amazon.co.jp/dp/B00IEY03YM So who's getting it? this is one of my favorites for the petites. ishtar doesn't get enough love. the colors came out nice. 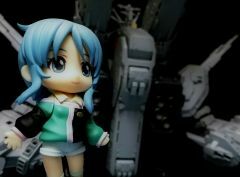 and i used the yamato 1/3000 for the background. all done with a cell phone. Will You Purchase Macross 2 on Bluray? I figured I'd start a thread about the VF-2SS Valkyrie from Macross II. I'm attempting to sneak in some Macross II profiles for the M3 before Macross Frontier gets underway in April. I'm very unfamiliar with Macross II. Unlike all the other Macross shows, I've only ever seen Macross II once and it was many years ago. Needless to say I didn't care for it, but I'm building a VF-2SS profile now so I'll need a bit of help. First off, I need to know if I got the colors correct. All the pictures online are very deceiving about the VF-2SS and some seem to give the fighter a blue tint. SO I've created a small comparison picture that I'd like fans to review and comment. EDIT Removed original pictures and inserted the most up to date color set Aside from the color, I'd like some information about the VF-2SS. There is next to nothing as far as statistics or official write ups, so the any official information you can provide would be appreciated. hellohikaru and Jedi Knight made a poster that contained some information, can they (or anyone else) confirm if these statistics are canon? Basically, I'm looking for facts and trivia I can build into a "Macross Mecha Manual-like" profile. What did the VF-2SS do? What are its capabilities? What is more advanced than previous generation Valkyries? If You've read the profiles on the M3, try to think about the kind of information that would fit into such a profile for the VF-2SS. Any help is appreciated.